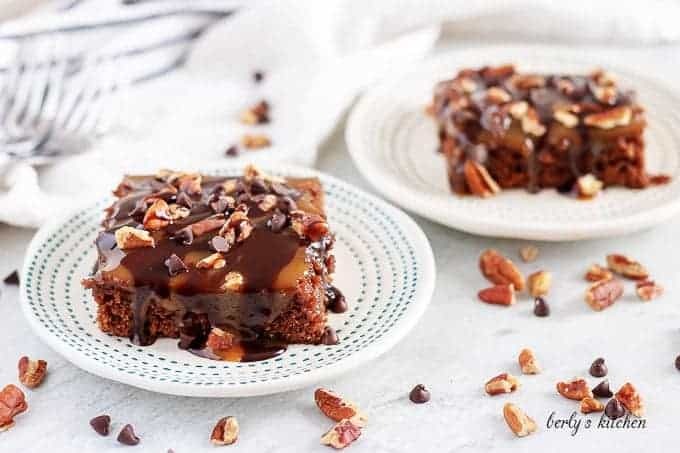 Turtle Brownies are covered with layers of caramel, chocolate sauce, and pecans. These rich and decadent brownies are sure to become a favorite. Alright, who’s ready for another republish? Yes, no? Well, either way, you’re getting one, LOL. However, this is one to be excited about. 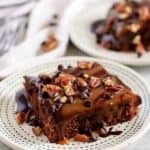 Turtle brownies, I can’t think of a more decadent dessert. 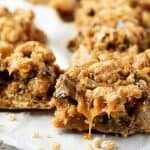 This recipe was originally published back in April of 2016. Unfortunately, it has not done well. As the years have gone by, Kim and I realized that long recipes just don’t produce results. So, she made a lot of changes to this one. Going from a homemade recipe to a semi-homemade version using a brownie mix. Hopefully, you everyone will enjoy them and find these turtle brownies as tasty as the last ones. If brownies aren’t your thing, then check these cut out sugar cookies, or take a look at the links we have below. Now, let’s get cooking! To begin, preheat your oven to 350 degrees F. and grease a nine by thirteen (9 by 13) inch cake pan. We use non-stick cooking spray most of the time and it works just fine. 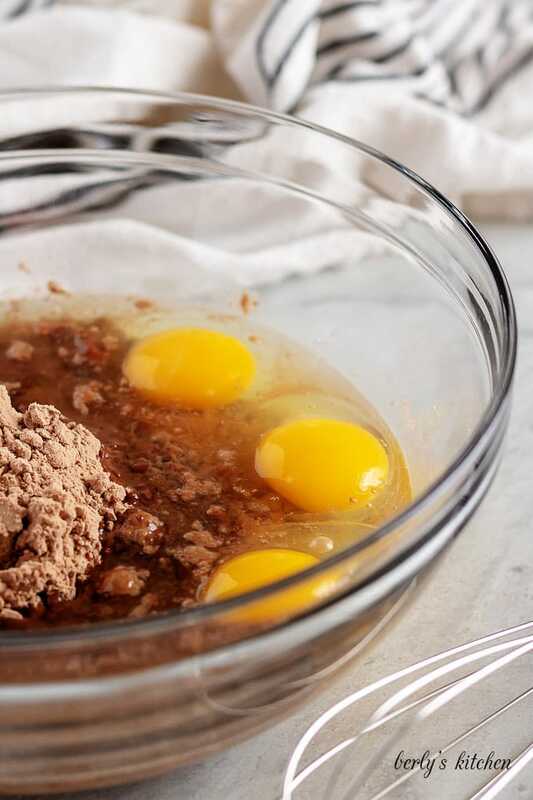 After that, grab a large mixing bowl and toss in the brownie mix, eggs, water, and oil. You can use a whisk or hand mixer to combine the ingredients into a smooth batter. When the batter is ready, pour it into the prepared cake pan and bake the turtle brownies for twenty to twenty-five (20-25) minutes. Or, until they’re done using the, “toothpick,” method. Once baked, set them on a cooling rack to cool. It’s time for the easiest part, assembly. When the they have cooled, use a wooden spoon or dowel rod to poke holes into the brownies. According to Kim, only poke them about half-way through. Do not go all the way to the bottom of the pan. 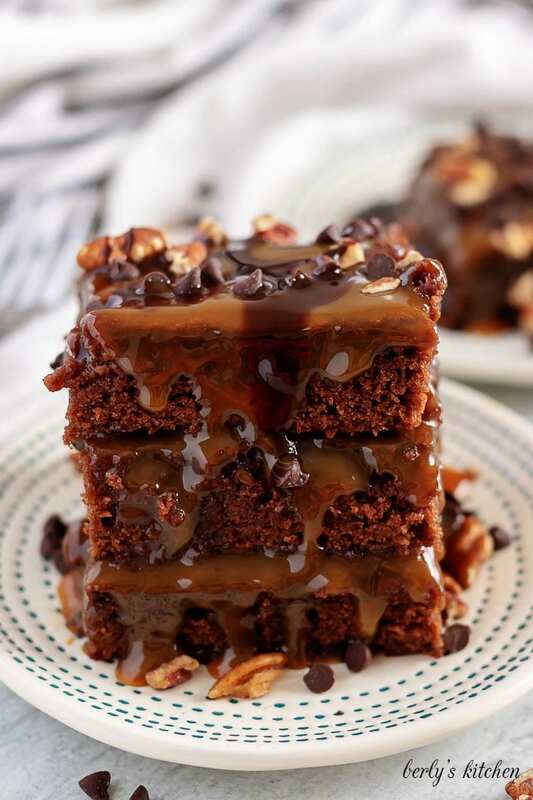 At this point, you can now start pouring on the caramel sauce. Try to drizzle it evenly over the cooked brownies. Then use a rubber spatula to smooth it all out. The final step is to place the pan into your fridge for one to two (1-2) hours to set. Afterward, cut the turtle treats into twenty (24) even-sized squares and serve. Kim and I hope you enjoy this recipe and like the changes we made. Okay, if you’re interested in making your own caramel sauce, or can’t find it locally, then click the link. This is the same sauce we use in a lot of our homemade desserts. For the best brownies, Kim recommends using the, “cake-like,” brownie mix option. The, “fudgy,” versions are great, but can’t hold up to all those sweet toppings. One last thing, Kim prefers to reheat her brownies in the microwave for a few seconds, after they’ve been stored in the fridge. Preheat oven to 350 degrees, and grease a nine by thirteen (9 x 13) - inch cake pan. Prepare boxed brownie mix according to package directions choosing the “cake like” brownies option. Pour the brownie batter into the cake pan, and bake for twenty to twenty-five (20-25) minutes or until a toothpick comes out almost clean. Set the brownies aside, and allow them to cool completely. Use the end of a wooden spoon to poke holes across the brownies. Don’t poke through to the bottom, just about half way through. 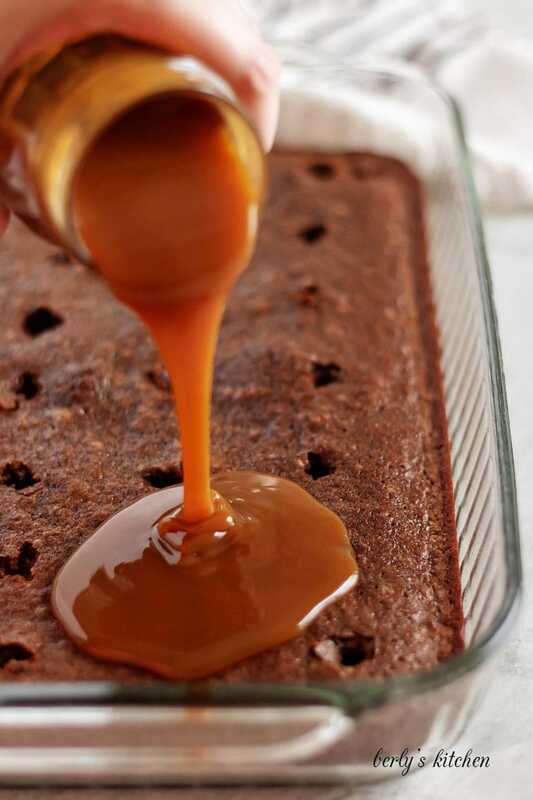 Pour the caramel sauce over the top of the brownies, and use a spatula to spread the sauce into an even layer. Sprinkle the chopped pecans over the brownies and drizzle with chocolate sauce. Place the brownies in the refrigerator to set for at least an hour. After an hour passes, cut and serve! 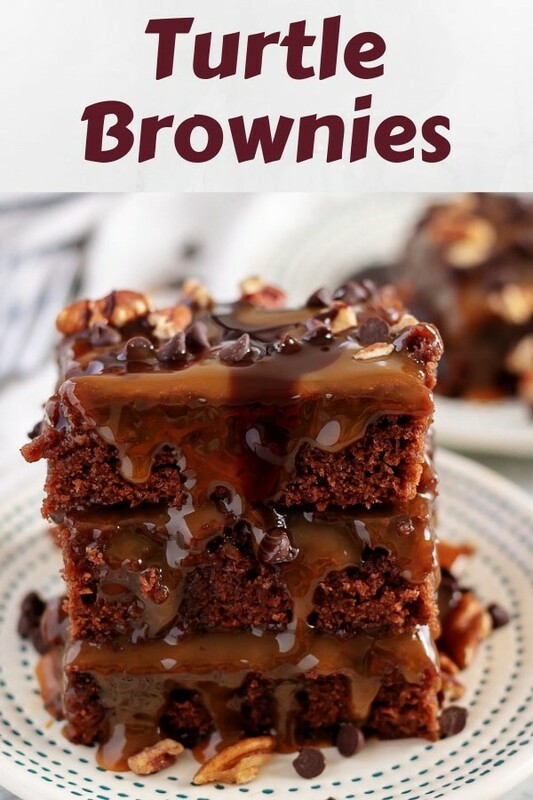 The calories listed are an approximation based on the ingredients and a serving size of one (1) brownie (when the turtle brownies have been cut into twenty-four ((24)) equal sized servings). 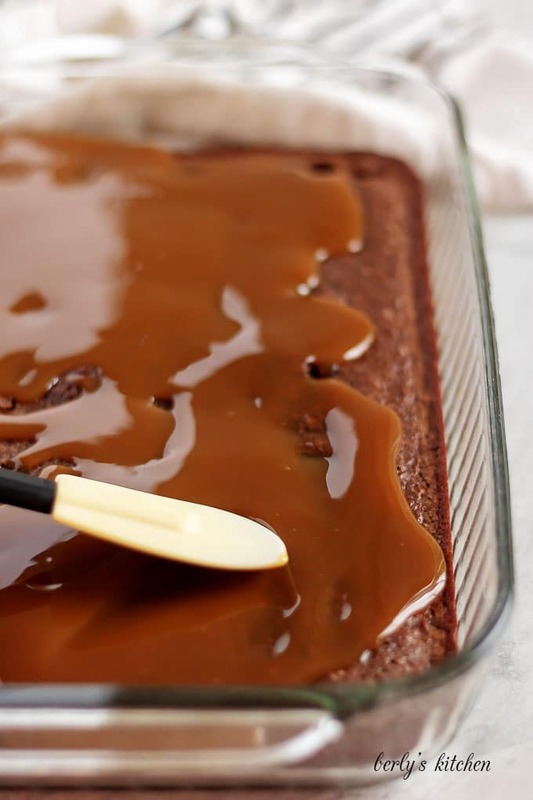 Actual calories will vary based on brownie mix used, caramel sauce used, etc. The brownies can be stored in your fridge in a sealed container for up to three (3) days. I am drooling just looking at these!!! They look fantastic! Thank you, Magnetra! I am thrilled you like them. However, please don’t drool on your keyboard lol! Wow! These look amazing. 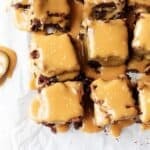 I’ve heard of poke cake, but now I’ve got to try poke brownies! Thank you, Aliza! Give them a try, they are really tasty!